Denney has led quite a career at being a Colorado Cowboy! A former Cowboy, guide and outfitter who still enjoys driving his team and wagons. He works his hay fields and still doing farming with his horses. 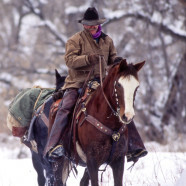 A current member of the Four Corners Back Country Horsemen he continues to teach clinic on back country packing. And, Denny also is a member of the Four Corners Draft Horse, Mule & Carriage Association and enjoys monthly outings and gatherings.